Reminisce about your favorite experiences from your childhood, teenage years and adult life. Write down about 20 of them and then, narrow them down to your Top Ten. Repeat the same process for the greatest struggles you’ve faced in life. How did you feel about God in those good and bad times? How was God at work in your life during those experiences? Narrow down your experiences to one or two that you can use to craft your Faith Statement around. Perhaps your Faith Statement will express conflict (the struggle experience) and then the resolution (positive experience). You can use Scripture to connect how God was at work in your life. Find a Bible verse(s) that deals with those experiences and God’s work in your life. You may find it valuable to write numerous Faith Statements built around different experiences. Depending on the situation, you can choose an applicable Faith Statement appropriate to the one with whom you are talking. For example, if you craft two Faith Statements, the first about how God’s forgiveness and love were there for you during a divorce, and second, about how God blessed you growing up in a Christian home with Christian parents, then if you’re talking to a person struggling in divorce, you would choose the applicable Faith Statement. Keep in mind, although you write out these Faith Statements, you would verbally articulate them in spoken word when one on one with your neighbor/friend. You could, however, send an email with your written Faith Statement to that person if it would be beneficial. Know and describe the truth(s) about God expressed in the chosen Bible verse. Articulate how this Bible verse connects to Jesus and what He has done for you. Articulate your present day and future hope as a child of God. I encourage you to use appropriate information about Jesus and the context of your Bible verse, as well as at least one personal story from your own life that relates to the chosen Bible verse. Articulate how you are Loved by God, using a Bible verse and then elaborate using a life experience. Articulate how you are Sent by God, using a Bible verse and then elaborate using a life experience. •	Ask God for the ability to write from the heart. •	Your Faith Statement may be 2-3 pages in length. •	Incorporate a specific Bible verse and how it applies to your life. •	The following is offered as a guide to assist your thought/writing process. You don’t have to elaborate on each point below; however, you may find yourself touching on many of them. II. What do you believe about our Triune God – Father, Son and Holy Spirit? A. Share what it is that you believe about the Triune God. III. How has faith in Jesus Christ impacted your daily life? A. Explain your living and active faith in Jesus Christ and why it is important to you. B. How has your relationship with Jesus impacted your relationships with friends and family? C. How has the presence of God made a difference in your life at work, church, or family? IV. How has faith in Jesus carried you through difficult times in your life? A. Share how your faith in Christ has helped to keep you strong when the storms and temptations have confronted you? How has it grown your faith? B. Share examples/stories of how God has been with you through the ups and downs. Share when and how you experience the presence of God. C. Are there other Bible verses that have especially been helpful for you on your faith journey – in the good times and the bad. V. Share how you intend to live out your life as a Loved and Sent child of God. B. Bear Christ’s light; spread God’s love through your words and actions. C. Serve all people, following the example of Jesus who laid down His life for you. D. Work for peace and justice in your home, work, and the world. Reviewing the Apostles’ Creed, list various truths it expresses that you not only believe but that you also find very applicable to your life. You don’t need to express each and every point of truth, but keep it concise and clear so you can easily articulate it to a friend or neighbor. Click here for the Apostles’ Creed worksheet. Use the 60-second Gospel as a guide for you to craft your own expression of God’s love in Jesus for us all. Can you express what is needed in 60 seconds? Click on the image for the complete 60 second gospel. There are no wrong Scriptures to use for crafting a Faith Statement. After all, “all Scripture is God-breathed and useful...” (2 Timothy 3:16) Yet, I offer the following as a spring board to your prayerful journey in God’s Word. You can also do an online search for certain key words in Scripture that apply to your life. 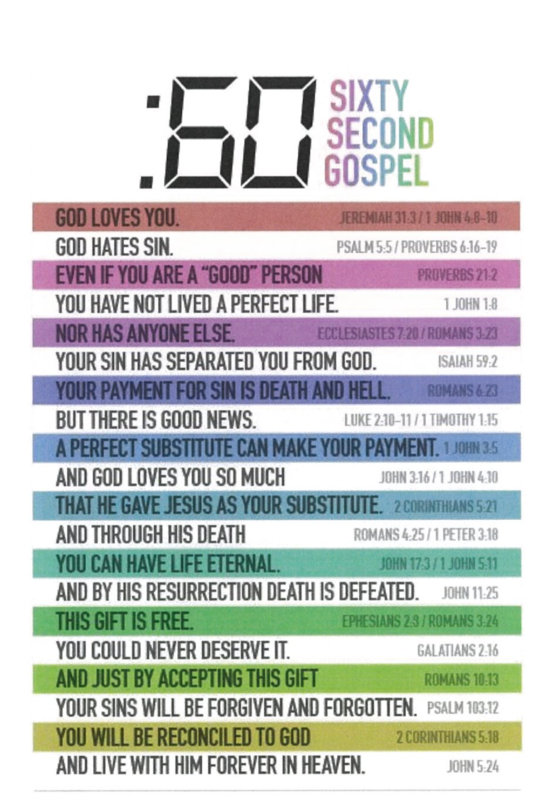 There are many, many good and appropriate Scripture verses; certainly this list does not contain all of them.